2. 4 LED power indicators shows power status of external battery case(25%--50%--75%--100%). 3. ON/OFF Button for Optional Power Output Control Galaxy S8 Plus / Galaxy S8+ battery case use Grade A+ batteries with CE and RoHS certification. 4. Full protection to corners and sides, protecting your Galaxy phone from drops and impacts. 5.The battery case intelligently stopping charging when your iPhone is 100%.Protecting your phone battery. 1. Just fully put your Galaxy S8 Plus into the wireless battery case. 2. Pressing the power button on the bottom of the Galaxy S8 Plus battery case for 3 seconds, the case will start charge your Phone. 3. Pressing the power button of the Galaxy S8 Plus battery case in 3 seconds again, the case will stop charging. 1. 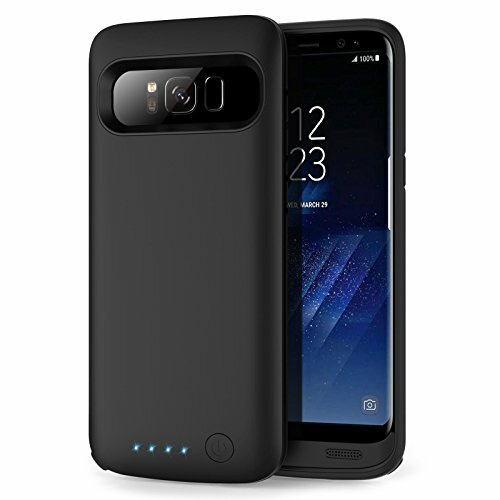 This battery case is just fit for Galaxy S8 Plus / Galaxy S8+ [6.2inch], Not fit for others. 3. The charger cable is NOT included. 【GALAXY S8 PLUS】This Galaxy S8 Plus rechargeable battery case 6500mAh can effectively provide 140%+ extra battery life to your Galaxy S8 Plus phone. The best and the first choice for the outdoor power companion, enjoying your day and do not worry the battery run out suddenly. 【SYNC&CHARGING】You can conveniently charge and sync both the battery pack and Galaxy S8plus to your PC, laptop without having to remove the battery cover. 【360° PROTECTION】① The Galaxy s8+ battery charging case is not only a portable charger case, but also a 360° protection for cellphone from scratches and other daily wear and tear.② Internal high quality chips also protect your Galaxy s8 plus from overheating, short-circuiting and over charging. 【HOW TO USE】① Slide your Galaxy S8 PLUS all the way into the bottom section of the case and make sure the case's connector is fully inserted into the phone.② Press the LED status button for about three seconds. 【WHAT YOU GET】 1 x Galaxy s8 plus Battery Case 6500mAh , 1 x User Manual. Also you will receive 12 months warranty and 30-days hassle-free return service. ★Just feel free to contact us first if you have any product problem★. If you have any questions about this product by Pxwaxpy, contact us by completing and submitting the form below. If you are looking for a specif part number, please include it with your message.